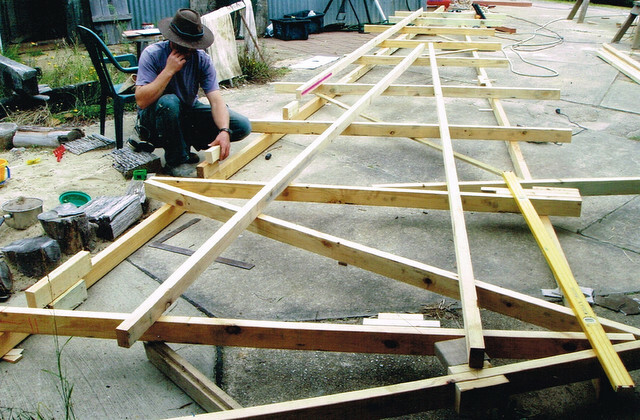 We fabricated the roof trusses back at the workshop where we had flat concrete, then drove very slowly to site. The furniture we made on site including the desk, windows, shelves benches, kitchen and the bed. Rick wanted the same hand making everything so it would all be the same style. The entire bathroom is raw western red cedar, smells great. All ceilings are made of full sheets of ply with a 10mm shadow line to the walls, so everything had to be perfect. Robin Clarke cleaning up the builders mess before handover.